Armed Forces Minister Florence Parly will today visit the aircraft carrier Charles de Gaulle on the occasion of the official completion of the ship’s mid-life refit, carried out under the management of the Directorate General Armament (DGA) and the Fleet Support Service (SSF). The aircraft carrier is now again available for Navy operations. From the first quarter of 2019, she will be able to leave on an operational mission with her entire air group. Florence Parly, who will spend the night aboard, will also celebrate the 40th anniversary of the Nuclear Naval Aviation, which implements the airborne component of the Navy’s nuclear deterrence. After 15 years of operational life, the aircraft carrier Charles de Gaulle has undergone an in-depth refit and modernization to maintain her operational performance until her withdrawal from active service around 2038. -- The platform with, in particular, the modernization of the ship's automation systems, the renovation of the dynamic ship stabilization system, the replacement of two units of the ship’s refrigeration system and the complete refurbishment of one of the two galleys. This mid-life redesign was also used for heavy maintenance operations of major facilities, such as the two nuclear boilers, including the replacement of their fuel; maintenance of the electrical plant, catapults, power lines. shaft, and stabilizer fins. This extremely complex project mobilized an average of more than 2,000 people on board every day, half of whom came from the Ministry of the Armed Forces. After a trial phase alongside and at sea, the Charles de Gaulle and her crew will now begin a training cycle under the authority of the admiral commanding the Naval Task Force (ALFAN) and Admiral Commander Naval Aviation (ALAVIA). The revival of the ship will lead to operational missions again from the first quarter of 2019. To prepare for the future, an 18-month study phase for the aircraft carrier renewal program was announced on 23 October by Florence Parly at the Euronaval show. 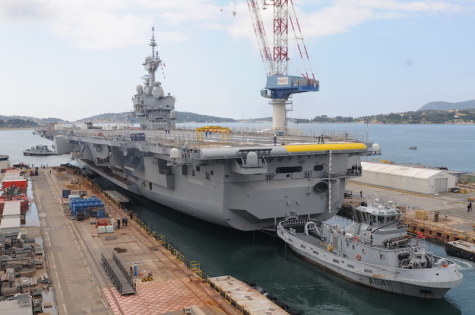 The sole prime contractor for the entire mid-life refit of the Charles de Gaulle aircraft carrier, Naval Group has returned the vessel to the French Navy. The vessel will now start ramping up its systems before returning to its operational cycle. Designed and built by Naval Group and entering service in 2001, the Charles de Gaulle aircraft carrier, further to its modernisation, has now entered the technological era of the 21st century. This mid-life refit included unprecedented renovations and a density of work that gave the project a level of complexity unseen until now. This veritable industrial challenge required exceptional organisation to achieve the real-time coordination of the entire project, Naval Group’s core business. “We are proud to have completed this exceptional project at the service of the French Navy within the imposed deadlines. I would like to thank in particular our clients, the DGA (Direction Générale de l’Armement) and the SSF (Service du Soutien de la Flotte), who entrusted us with the responsibility of overall prime contractor. This success is the fruit of a collective effort made possible by the commitment of the aircraft carrier’s crew, Naval Group’s teams, those of the Defence sector’s major original equipment manufacturers such as Technicatome, Thales or Safran, the generalist companies and the SMEs originating mainly from the local and regional industrial fabric”, underlines Nathalie Smirnov, Senior Vice Président Services at Naval Group. The in-depth renovation of the Charles de Gaulle aircraft carrier was performed to ensure the vessel’s operational performance levels for the next 25 years and ensure that it maintains its technological advance at the service of France’s interests. This refit focused on three major challenges. Firstly, the modernisation of the combat system in particular with the modernisation of the tactical system, the brain that manages the sensors and weapons, the installation of new digital networks, the complete replacement of the Control Room, the renovation of the telecommunications systems, the replacement of the air search and navigation radars. Secondly, the modernisation of the aviation installations covered all the necessary modifications to switch to an “all-Rafale” setup: modification and renovation of the aviation spaces, renovation or replacement of deck-landing systems. The third challenge of this refit relates to the renovation of the platform i.e., amongst other things, the modernisation of the vessel control PLCs, the renovation of the automatic stabilisation and steering control system, the replacement of two units of the vessel’s cooling system, but also the refit of the control simulator and of one galley. In addition to this renovation, the mid-life refit of the Charles de Gaulle aircraft also comprised through-life support work. This aspect of the project related essentially to the maintenance of major installations: the inspection of the two nuclear reactors and the replacement of their fuel elements, the maintenance of the electrical power plant, the maintenance of the propulsion system, the inspection of the catapults, shaft lines and stabilizing fins, and the painting of the underwater hull and topsides. This exceptional programme was conducted by “Team France” bringing together the DGA, the French Navy, the SSF, the aircraft carrier’s crew and actors from French industry. Naval Group worked with major Defence original equipment manufacturers such as Technicatome, Thales or Safran, generalist companies but also SMEs originating mainly from the local and regional industrial fabric. The aircraft carrier entered dry dock in February 2017; it was floated out in May 2018 and at the end of July 2018 it docked at its operational quay for harbour acceptance trials. It then performed sea outings for the trials that must be performed in operational conditions, with the support of other French Navy entities. The final date on which the vessel was made available was 16 October 2018, after the complete recertification of the systems was completed.